One of the most visited landmarks in Rome, Vatican City is the world’s smallest state. Located in the heart of the Italian capital, it has been shrouded in mystery since its very inception. Small but boasting an overwhelming wealth of artwork, visiting the Vatican City can be intimidating. 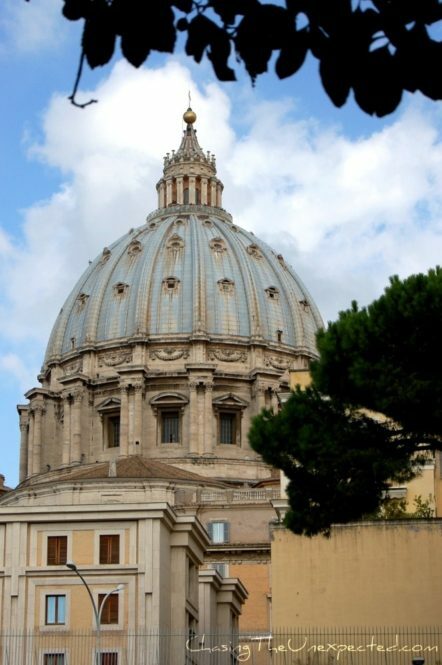 Here is an extensive and complete guide to the Holy See, what to visit, opening hours, how to get there, how and where to buy the tickets and how to skip the lines. All peppered with tales and anecdotes with what has been going on in the Vatican for centuries. 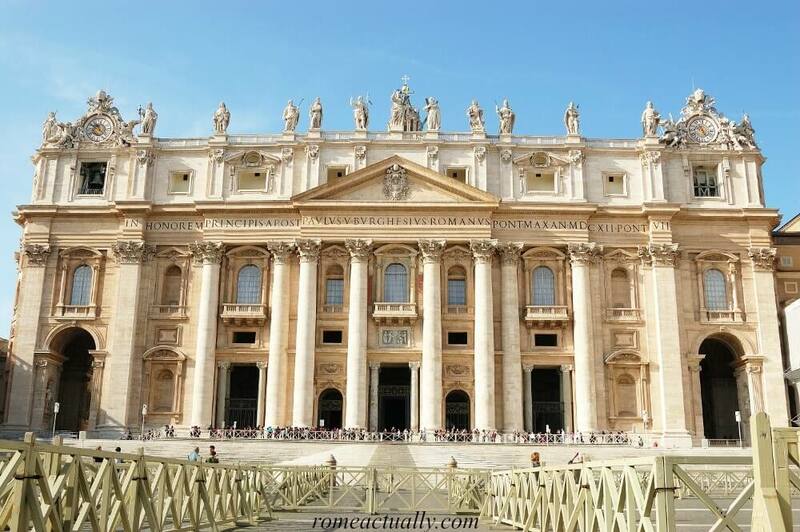 Visiting the Vatican City is a must during your Roman holiday. Here’s how to get the most out of it. UNESCO-listed Vatican City as we know it, as an independent state inside the capital of unified Italy, was established on February 11th, 1929 through the signing of the Lateran Treaties between the then Prime Minister Benito Mussolini and the then Holy See Chief Pope Pius XI. Even though a tiny state, the Vatican has its own currency, police, prison, and laws. The pope is the Chief of the state and holds legislative, executive and judiciary power. Located on the right bank of the Tiber River, it covers an area of 44 hectares. The citizens of the Vatican are less than 1000, have Vatican passports and around half of them doesn’t live in the Vatican but abroad for duty, usually diplomats. Pretty much every country has two embassies in Rome, one to Italy and one to the Vatican State, adding the parking perpetual issue as many spaces are designated for diplomats. 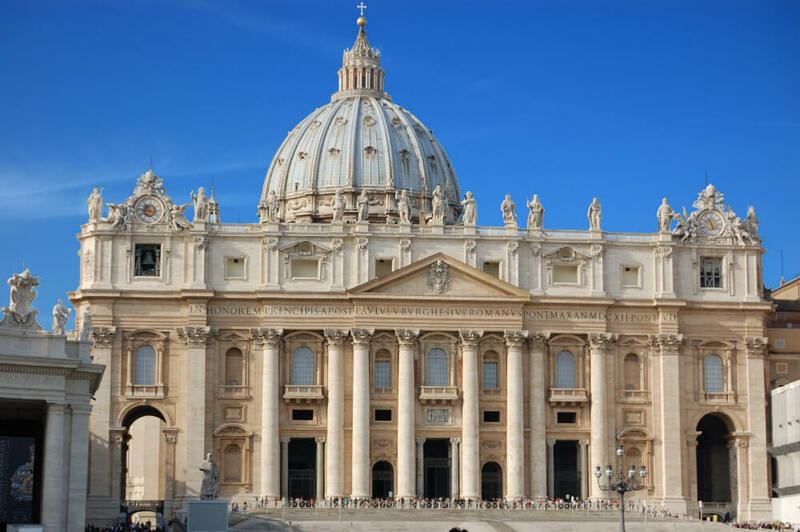 Although the modern Vatican City State as we know it was established in 1929, the history of the Vatican is way older and more complex than we might think. The first 1,000 years of existence of the Vatican are very obscure and the historic findings relating to this period are at times uncertain. Before the fall of Rome and the Western Roman Empire, officially set in the year 476 AD, the history of Christianity is one of persecution, at least until AD 313 when Roman Emperor Constantine ensured religious tolerance and freedom with the Edict of Milan. The same emperor started an era of building important places for the Christian religion with the 4th-century Lateran Basilica, but it’s only from the 6th century that documented sources testify the place as the official papal residence. Before that, popes often lived in the catacombs mainly out of the urban area. They only gradually started taking control of buildings inside the city, one of the main events being the transformation of the Pantheon from pagan temple to all gods to Christian worship place in AD 609 and when pope John VII moved his residence to the Palatine Hill among the ruins of the ancient imperial palaces to be under the protection of the Byzantine Duke (representative of the Eastern Roman Empire) but also to start seizing places symbol of power. After the fall of Ravenna as the capital of the Eastern Roman Empire in AD 750, things started to change for the papal quest for power. Popes moved to the Lateran Basilica making it look majestic and apt to symbolize that from now on the ruling of the city was in their hands. Before settling in the actual Vatican, though, popes moved a lot in different places around Rome. Some of their residences were on the Aventine Hill (Santa Sabina Basilica), Santa Maria Maggiore basilica in the Esquilino Hill, the Quirinale, where now is Italy’s President, that was started by Gregory XIII and expanded by Sisto V, but also outside Rome in cities like Assisi, Ferentino, Anagni, Tivoli, Orvieto, Perugia and Viterbo. Popes Niccolò V and Alessandro VI (the infamous Rodrigo Borgia) were the ones who started to settle for a longer time in the Vatican premises and began to embellish and build more parts, apartments, and wings. Officials and representatives of the Roman Curia were sent and operated in the city’s many districts, especially Trevi area. Gradually, the Quirinale Palace became the seat of the pope-king, where he would fulfill his functions of chief of the state, including governing a kingdom, defending their border and keeping relations with the rest of the kingdoms in Europe and Italy, while the Vatican was for the pope bishop where religious celebrations would take place. The incorporation of Rome into unified Italy put an end to the secular role of the pope as ruler of a kingdom to all effects and purposes and limited his powers as the spiritual guide of the Christendom. With such as long history, it’s normal that the Vatican enshrines countless art masterpieces. 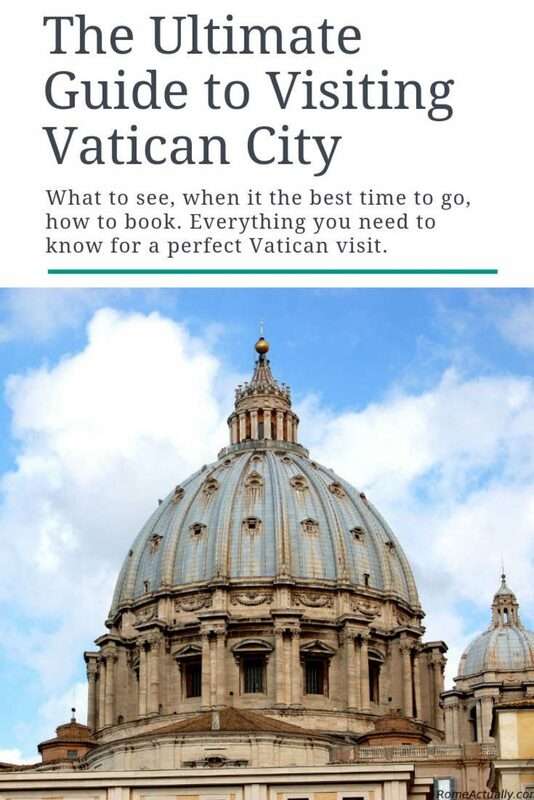 While it would take a week only to visit all the places that are worth a stop in the Holy See, and you probably can’t devote all your holiday to the Vatican, this guide is meant to help you decide how to plan your visit to the Vatican. 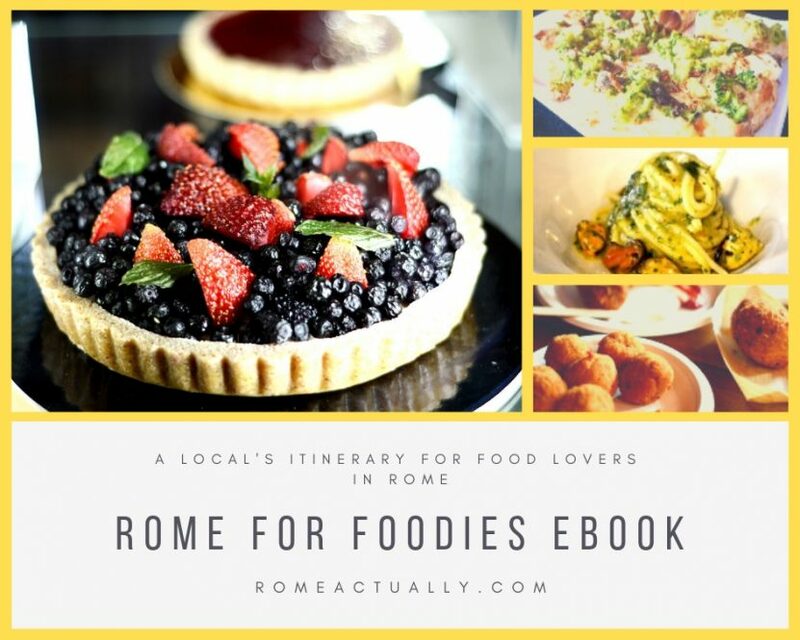 In Rome and you don’t know where to eat? Click here to find out 6 must-try restaurants in the city! The soil where now stands Saint Peter’s Basilica was originally used as the place for the Circus wanted by Caligula, Roman emperor from 37 to 41 AD, close to which they then built a huge cemetery that you can visit still now. More to this Roman Necropolis later in the post. The basilica as we see it today lies on top of the former basilica devoted to Saint Peter Apostle commissioned by Emperor Constantine. The original basilica was some three times bigger than the modern one. The switch from the Constantinian building to today’s Basilica was gradual and went through different renovation works. Started by Pope Niccolò V, they lasted for about 150 years and saw a glorious sequence of some of the most famous artists of the time, from Raphael to Michelangelo who, among the other things, designed the dome and personally followed the construction until he died in 1564. The interior of the majestic basilica enshrines a fascinating sequence of historical and artistic layers through sculptures, paintings, and historical landmarks, such as Saint Peter’s Baldachin, a large bronze canopy Baroque-style built in the 17th century, and the porphyry ring placed at the entrance Charlemagne kneeled on at his coronation on December 25th 800. 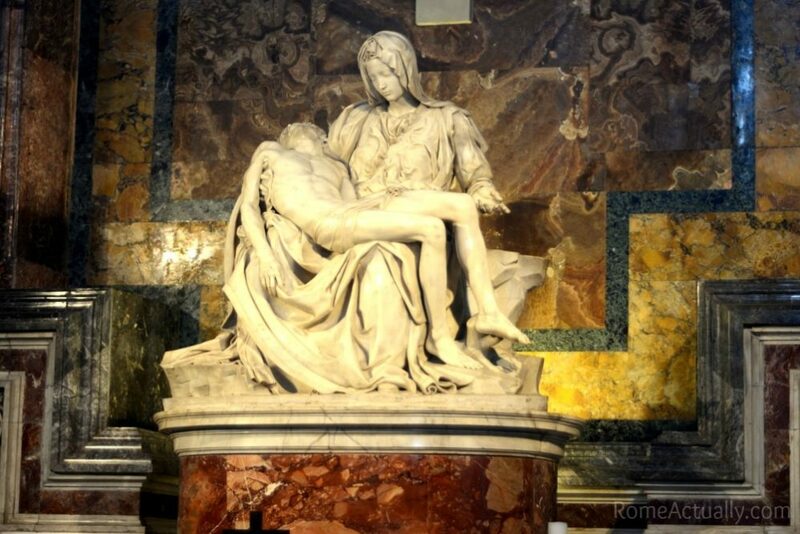 By all means, do not miss the beautiful sculpture La Pietà by Michelangelo, the artist’s first masterpiece, and the only one he signed. With an accurate glance, you will notice that Mary looks younger than her dead son. The official explanation is that Michelangelo was inspired by the verses of Italian poet Dante Alighieri’s commanding Divine Comedy (“O virgin mother; daughter of thy Son“), where Mary is the symbol of purity. There is another theory, however, that places the sculpture closer to the personal life of the artist. 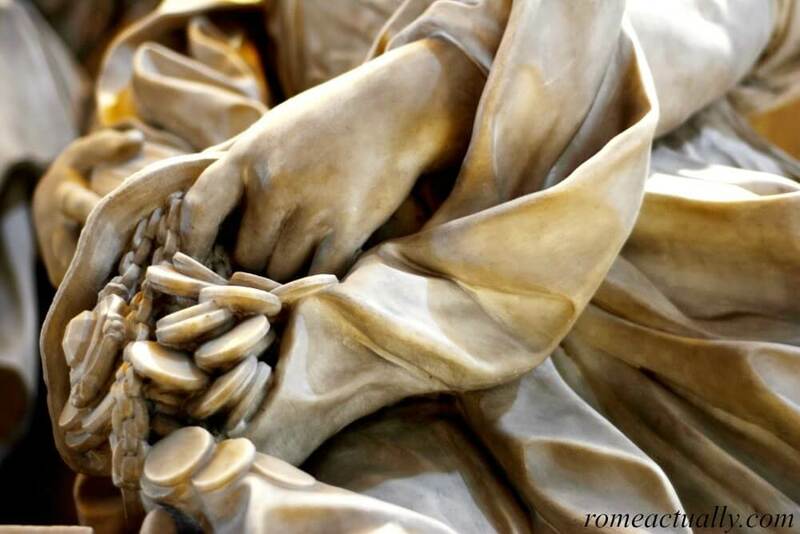 Michelangelo lost his mother when he was only five, and sculpted La Pietà at 24 years of age. In his mind, his mother was a young woman, so it’s not unlikely that he portrayed his mother’s face as he remembered her. Popes’ tombs can be found inside the basilica and beneath it, in the crypt (free admission). There are also three women whose resting place are inside Saint Peter’s Basilica, Christina Queen of Sweden, Matilda of Canossa (or of Tuscany), and Maria Clementina Sobieska. With its 190 meters of length, Saint Peter’s Basilica can accommodate approximately 20,000 people, and the final consecration of the renovation works took place in 1626 with the blessing of Pope Urban VIII. How to get to St. Peter’s Basilica: The nearest metro station is Ottaviano, line A (red). Buses that get close are 64 and 40 from Termini Station that goes through the main places in the city center. The nearest train station is Stazione Roma San Pietro in Piazza della Stazione di San Pietro, some 15 minutes walking from the Vatican or two stops with the 64 bus. INSIDER’S TIP: Do you want to dig deeper into Christianity’s most important place? Check out the current prices for “Walks of Italy” private tour to St. Peter’s Basilica, the Crypt, and the Dome, and that will also make you skip the line. When visiting the Vatican City, trust me, you don’t want to miss this. Located underneath the main basilica, some 13 meters beneath today’s street level, the Roman cemetery is where, according to historical research, Saint Peter Apostle was martyred by being crucified upside down. A Roman cemetery that was once open-air, it hosts the tomb of Saint Peter found when Pope Pius XI ordered to start digging. In this city/cemetery, the graves are mixed, Pagans and Christians, Roman families with their Christian servants buried in the same house and each house have their own terrace because it was believed that the dead would feast together. To visit this ancient graveyard, you need to book in advance by getting in touch with the Ufficio Scavi (Excavations Office). This is hands-down one of the most beguiling places you can visit in the Vatican. Dress code: Modest, it’s still a graveyard and where is Saint Peter’s tomb. Men wearing long trousers, women long skirt or trousers, all covering the shoulders. Visiting hours: The Ufficio Scavi is open every day except Sunday and holidays 9 am-5 pm. The last entry is at 3.30 pm (4.15 pm from April through September). How to book: By fax (+39 06 69873017) or directly at the ticket booth on the left side of Bernini’s Colonnade. You can also try to book before you arrive by email writing to scavi@fsp.va or uff.scavi@fabricsp.va. – The way you would like to be reached (email, fax, phone, house address). 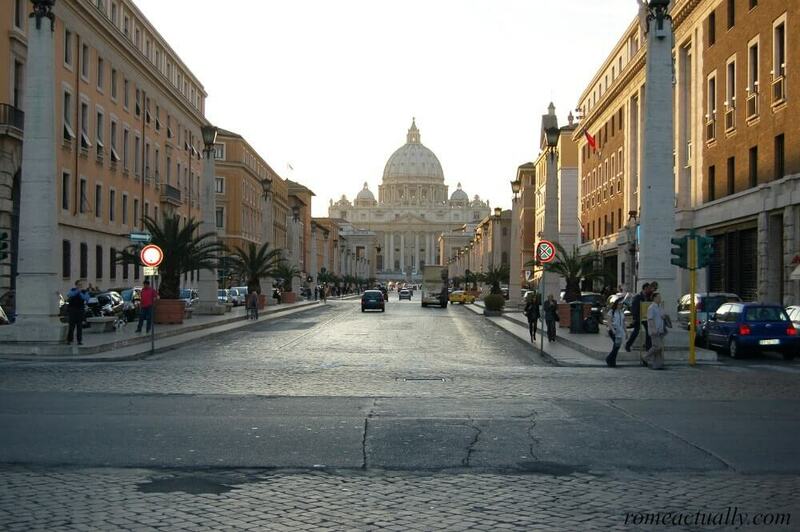 Location: Piazza San Pietro, entrance on the left of the Colonnade, access from Via Paolo VI. How to access the visit: Visitors need to arrive at least 10 minutes prior to the arranged visit time. Show the Swiss Guards the confirmation of your booking or the email received from the Ufficio Scavi with the time of your visit. Items not allowed items: large bags, backpacks, and cameras. A deposit area free of charge for these objects is available to the right of the façade of the Basilica on the ground floor level of the Basilica’s premises. How to get there: The nearest metro station is Ottaviano, line A (red). Buses that get close are 64 and 40 from Termini Station that goes through the main places in the city center. The nearest train station is Stazione Roma San Pietro in Piazza della Stazione di San Pietro, some 15 minutes walking from the Vatican or two stops with the 64 bus. The dome of Saint Peter’s Basilica stands 136 meters tall and can be spotted from afar, making always for an iconic photography subject. Designed by Michelangelo, after his death in 1564, his pupil Giacomo della Porta took over the project. The dome has an inner diameter of more than 42 meters and is 136.57 meters tall. Once you visit the basilica, you have the option to climb up to its Cupola (Dome) and enjoy a breathtaking view of the city center. You can go either with the lift from the ground level to the terrace or you can climb all the way up (551 steps). Even if you take the lift, you still need to walk 320 narrow steps to the top of the Dome because the lift gets only to the terrace. Here, you will find toilets and a cafeteria to freshen up and refuel before enjoying a view of the interior of the basilica. If you feel like it, climb the extra 320 steps and go to the very top to admire the astonishing view of the city and St. Peter’s Piazza. Admission fee: 8€ with the lift and then you climb 320 steps or 6€ all the way up for 551 steps. Camera: allowed without extra charge. Opening hours: Every day from 8 am to 6 pm April to September; from 8 am to 5 pm October to March. Note: I recommend you not to do the 331 narrow stairs if you are not in good shape, scared of height or have heart issues because once you start the stairs, you will have to go all the way to the top the dome. Saint Peter’s Square (Piazza San Pietro) is an astonishing 17th-century piazza designed by Italian sculptor and architect Gian Lorenzo Bernini between 1656 and 1667 under the rule of Pope Alexander VII. The piazza is huge: 320 meters deep, 240 meters in diameter and surrounded by four rows of 284 columns and 88 pillars. The impressive balustrade garnishing the columns is crowned all along by 140 3.20-meter-tall statues representing the saints, completed around 1670 by Bernini’s pupils. Right in the middle of the elliptic part of the piazza stands tall an ancient Roman obelisk dating back to the first century BC. Originally, the obelisk was in the Circus of Caligula where the martyrdom of Peter took place and where the basilica was built on, and it was moved by Domenico Fontana in 1585 at the behest of Pope Sixtus V.
Located on the sides of the central obelisk are two fountains, one by Bernini (1675) and one by Maderno (1614), while at the bottom of the wide staircase there are the statues of Saint Peter and Saint Paul as if to welcome pilgrims and worshippers. From the piazza, you can better admire the beautiful facade of the basilica, a masterpiece of Italian architect Carlo Maderno who built it in 1614. 114.69 meters wide and 48 meters tall, the facade displays a series of columns and Corinthian lesenes on which a massive frame is crowned by thirteen 6-meter-tall sculptures with the Redeemer in the middle and an inscription to acknowledge that the work had been made under the rule of Pope Paul V Borghese. The lower part counts five entrances on top of which are nine windows, three complete with balconies. The window in the middle is the so-called “Loggia of the Blessings”, from where the pope grants the Urbi et Orbi blessing right after his nomination and for the celebrations of Christmas and Easter. How to get there: Bus 64 from Termini (stop in front of Borgo Santo Spirito Hospital then walk down Via della Conciliazione), Stazione San Pietro train station then bus 64 for two stops, Ottaviano metro station, tram 19 (stop at Piazza Risorgimento). Visiting the Vatican City is by no means complete without a tour of the Vatican Museums. The museums display some seven centuries of artwork commissioned by the popes or received as gifts from kings, presidents, and leaders from all over the world. Within the museums, there are many important monuments such as the Chapel of Beato Angelico, sometimes spelled Fra Angelico, Raphael’s Loggia, the Borgia Apartments, and the world-famous Sistine Chapel, ordered by Pope Sixtus IV della Rovere. Here you will admire Michelangelo’s fresco all over the ceiling realized between 1508 and 1512, and his stunning Universal Judgement painting on the main wall completed between 1536 and 1541. Admission fee: 16€ for adults, 8€ for children (6 to 18 years old), 8€ for students (19 to 26 years old). If you book online to skip the link, there is an extra 4€. Audio guides can be rented at the entrance. Opening hours: Monday to Friday 10 am-1.45 pm from November to February, 10 am-4.45 pm (during Christmas holidays they are open 8.45 am-4.45 pm), from March to October. On Saturdays 10 am-2.45 pm. On Sundays, the museums are closed except the last Sunday of the month, when they can be visited free of charge 9 am-to 1.45 pm. Entrance to the museums is allowed up to 75 minutes before closing time. Camera: Allowed in the Museums but not in the Sistine Chapel. How to get there: Metro stations Cipro-Musei Vaticani or Ottaviano (line A). Bus 49 (stop in front of the museums square), 32/81/982 (stop in Piazza Risorgimento), 492/990 (stop in Via Leone IV and Via degli Scipioni). Tram 19 stop in Piazza Risorgimento. The Vatican Museums get super crowded. If you want to fully enjoy the artworks and the Sistine Chapel in silence and taking your time, you should book a private tour. For early birds, Walks of Italy organize a great tour early morning with access to the museums before opening hours, while if you don’t feel like waking up too early, you can take part in their tour to the Vatican Museums and the Sistine Chapel where you can skip the line or their fascinating night tour to the museums and the Sistine Chapel after closing time. If you are thinking about visiting the Vatican City, do reserve some time to the beautiful gardens. Vatican Gardens have been a place of peace and meditation for the popes since 1279 when Nicholas III (Giovanni Gaetano Orsini, 1277-1280) moved his residence back here from the Lateran Palace. Larger and more recent gardens have been planted, covering, together with the original garden, about half of the 44 hectares of Vatican City State. 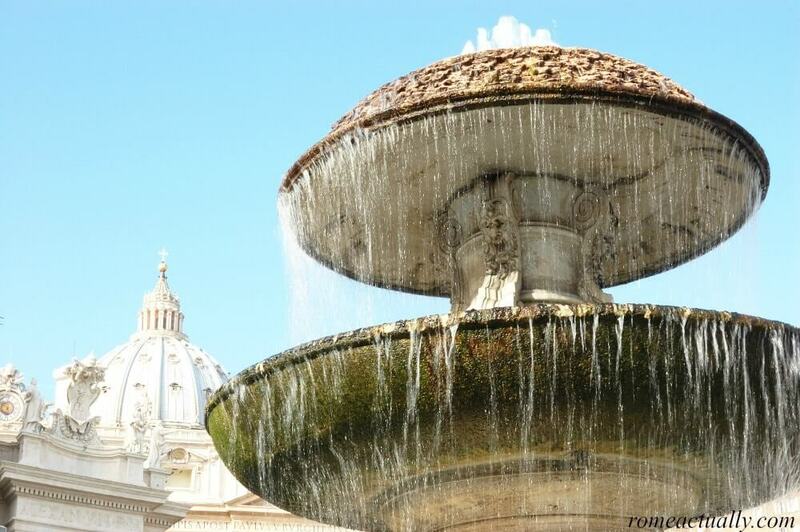 The Vatican Gardens can be visited only through guided tours organized by the Guided Tours of Vatican Museums. Tours depart from the Vatican Museums. Admission fee: From 32€ depending on the tour. Opening hours: Daily except for Wednesdays and Sundays. How to book: Tours of the Vatican Gardens are available in English, Italian, French, Spanish, and German. You can request another language when booking. Bookings can be made by fax (+39 06 6988 5100), by email (visiteguidate.musei@scv.va or tours.musei@scv.va), through the online form on the Vatican website at least two days in advance, or by phone (+39 06 6988 3145 or +39 06 6988 4676). Please note: show up on time, nor too early neither late. Vatican Garden dress code: Modest like in all other areas. READ MORE: See our post to discover more beautiful and least-visited churches in Rome. When visiting the Vatican City, you might get the chance to see the pope: he comes out in public twice a week, on Wednesday and Sunday. The Papal Audience is every Wednesday in Saint Peter’s Square in the summer and in the Audience Hall during winter. The audience starts at 10.30 am, but to secure a good seat you need to arrive early, the security check for the square starts at 8 am. The audience normally lasts between 1 to 2 hours. A ticket is required, even if always free of charge, and you can request it by phone (+39.06.69883114 or +39.06.69884631), or by fax (+39.06.69885863). Tickets are issued by the Papal Prefecture at the Bronze Door on Monday 9 am-1 pm or Tuesday 9 am-6 pm. You can also see the Pope on Sunday at noon. He appears from the window of his apartment, greets the crowds in various languages, gives a short speech and blessings to the people. It normally lasts around 20-30 minutes. No charge. When visiting the Vatican City, you might want to do some shopping. Close to the basilica, you will find a couple of shops selling souvenirs such as rosaries, postcards, calendars, photos, t-shirts, crucifixes, medals, posters and obviously, photos of the popes. Inside the Vatican Museums, you will also find some shops selling books and religious souvenirs. All around the Vatican, Borgo Pio quarter, Via della Conciliazione and the streets towards Piazza Risorgimento, you will find plenty of shops with religious souvenirs, themed jewellery, calendars, books, posters, etc. Weather-wise, it’s always a great time to visit the Vatican. Rome boasts a pretty mild climate, and even if you happen on a rainy day, most places to visit in the Vatican are indoor. Date-wise, the best time to visit the Vatican really depends on your preferences and religious needs. For example, if you are a fervent believer and practicing Catholic, you might want to go to the Vatican during important days in the Catholic calendar such as Christmas, Easter, or even the spectacular Via Crucis performed by the Pope usually at the Colosseum. Clock-wise, the best time to visit the Vatican is probably early morning or late afternoon, even though you always need to check the closing time and in the afternoon you might only have the time to visit St. Peter’s Basilica. For sure, visiting the Vatican Museums and the Sistine Chapel before opening hours or after closing time to enjoy them without being surrounded by the crowds is an absolutely unforgettable experience. You can do this with Walks of Italy’s Early-Entry Sistine Chapel Tour where you can access the Sistine Chapel 30 minutes before they open to everyone, and Vatican Museums Night Tour, where you access the Vatican Museums at 7.30 pm. Staying immediately close to the Vatican might be a little more expensive but it’s obviously handier as you don’t need to take the public transport to get to Saint Peter’s Basilica. Emmaus Hotel is a 3-star in Via delle Fornaci 25, very close to the Vatican and Stazione San Pietro. Free WIFI, 24h room service, and reception, restaurant are among the services. Click here more for details on Emmaus Hotel current prices. Alle Fornaci A San Pietro is a bed and breakfast in Via delle Fornaci 20. Rooms have a small fridge, tea set, private bathroom, and restaurant is inside. Click here for more details on Alle Fornaci a San Pietro B&B latest prices. If you don’t mind using public transport, you can opt for Le Scalette B&B in Via Fiamignano 6, close to train station Ipogeo degli Ottavi. You can take the train (towards Viterbo/Cesano/Bracciano, make sure it stops at EVERY stop) from Stazione San Pietro, Stazione Trastevere, or Valle Aurelia, where is also the metro station Valle Aurelia (line A). This B&B offers spacious rooms with private bathroom, free WIFI, satellite TV. Most restaurants right around the Vatican are for tourists, so the quality is not excellent. However, there are some exceptions. After visiting the Vatican City, try the Sardinian and Roman dishes of the restaurant I Quattro Mori in Via Santa Maria delle Fornaci 8, delicious food and affordable prices, plus a stone’s throw away from the Holy See. If you go on Wednesday or weekends, you might need to book to find a table: phone +39 06 639 0195. Heading a bit towards Prati quarter and shopping street Via Cola Di Rienzo, not far you will find restaurant Porto in Via Crescenzio 56 (phone number +39 06 4550 5797, website http://www.ristoranteporto.com). Fish restaurant decorated as if on a ship serving traditional dishes with a contemporary twist or new recipes with daring ingredient combinations. Food is absolutely delicious. On weekdays you can choose between menu à la carte or buffet all-you-can-eat for 9 euro per person including water, while Saturday and Sunday only menu à la carte. If you prefer a vegetarian restaurant, head to the Trionfale district, in Via Trionfale 94 for restaurant bistro Veg and Wine, former Taverna Vegetariana (phone number +39 06 3974 2975, website http://www.tavernavegetariana.it). Delicious vegan and vegetarian dishes, affordable prices.